For Greater Good » Blog Archive » For Greater Good Remixed & Reworked Session for the end of the world! For Greater Good Remixed & Reworked Session for the end of the world! This Friday, the 21st of December 2012 the world will end… or not? 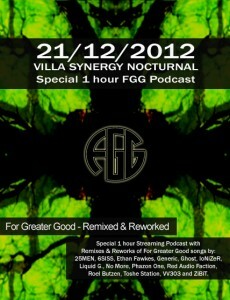 Anyways, we are glad to announce a one hour For Greater Good Remixed & Reworked special DJ-set at the Villa Synergy Nocturnal “The end is near” Special. For more info visit the FB-event-page or surf directly to the Villa Bota Site on Friday and tune in. « For Greater Good Remixed & Reworked – Batch 7! This entry was posted on Thursday, December 20th, 2012 at 3:45 PM	and is filed under free, Radio, Remixes. You can follow any responses to this entry through the RSS 2.0 feed. You can leave a response, or trackback from your own site.